Whoopie pies are absolutely delicious when they are done well, but can be downright boring when they are not. A bad whoopie pie might be bland or dry, with not enough filling to compliment the amount of cake surrounding it. The cake-like sandwich cookies should be moist and tender, but still strong enough to support a generous amount of frosting without falling apart when you go to take a bite. 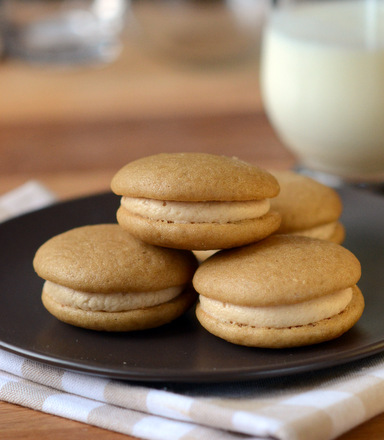 These Brown Sugar Whoopie Pies may seem simple at first glance, but they will surprise you with how much flavor they pack into every bite. The cookies are made with a brown sugar and buttermilk base. The batter is thicker than a cake batter, but thinner than a traditional cookie dough. The batter can either be spooned onto a baking sheet or piped on using a pastry bag. Both methods work well, and I usually recommend choosing whichever you are more comfortable with. The important thing is that the cookies should be uniform in size, so that the cookies will pair up easily when you go to assemble your sandwiches. The cake-like cookies are moist and fluffy, with an airy texture and a nice high rise, which gives the finished pies a lovely look. I made a dulce de leche filling for these whoopie pies, adding some pre-made dulce de leche sauce to the filling mixture. 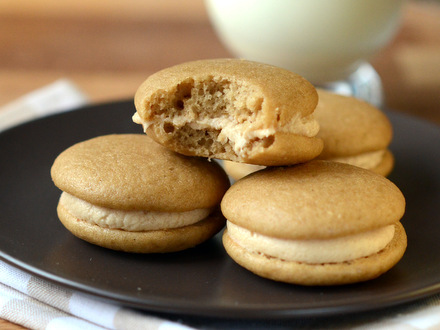 The caramelized sugar sauce has a lot of flavor and blends really well with the brown sugar cookies in the finished whoopie pies. If you don’t have dulce de leche available, you can make your own or use another caramel sauce. The brown sugar cookies also pair well with vanilla, chocolate and other filling flavors, if you want to play around with your own flavor combinations. The whoopie pies should keep well for 2-3 days after baking, if stored in an airtight container. 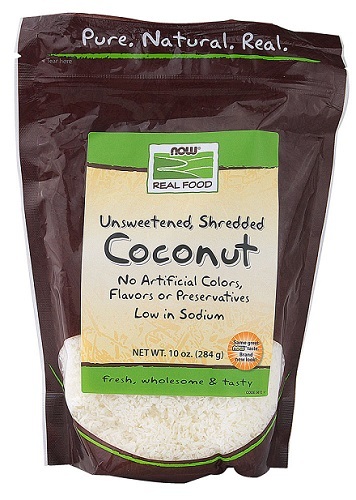 In a large bowl, whisk together vegetable oil, brown sugar, egg and vanilla extract until well-combined. Stir in half of the flour mixture, followed by the buttermilk. Stir in remaining flour, mixing just until no streaks of dry ingredients remain. Drop tablespoonfuls of batter, making them as round as possible, onto prepared baking sheet. You should have 30-32 individual cookies. Bake for 9-11 minutes, until cookies are set and spring back when lightly pressed. Allow cookies to cool on the baking sheet for 2-3 minutes, then transfer to a wire rack to cool completely. Combine all ingredients in a large bowl and cream together until frosting becomes thick and smooth. Add in additional milk if the mixture is too dry, or additional confectioner’s sugar if the mixture is too runny to be spread easily into the sandwiches. The filling sounds so good!